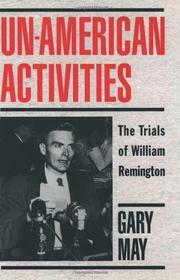  A revealing chronicle of the life of William W. Remington, a casualty of the McCarthy era's anti-Communist fervor. Remington entered Dartmouth in 1934 at the age of 16 and was a promising economist for the federal government by the age of 22. He eluded suspicion in loyalty checks early in his career; however, his contact with Soviet spy (turned informer) Elizabeth Bentley beginning in 1942 incited vigorous FBI investigations, precipitating indictments for espionage and Communism and subsequent trials for perjury. He was imprisoned in 1953 and murdered by inmates the following year. May (History/Univ. of Delaware; China Scapegoat, 1979) waged a two-year struggle against a US district court for access to 30-year-old grand jury records regarding Remington's case. From the documents, finally wrested from former US Attorney Rudolph Giuliani in the 1980s, May uncovers abundant evidence of illegal and unethical behavior on the part of investigators, prosecutors, and judges. Although he argues that Remington was tried unfairly, he does not exonerate him. The author's research reveals that Remington probably was a Communist and guilty of perjury. He ran in Communist circles in college, during employment with the Tennessee Valley Authority in 1936-37, and while in government service. He habitually lied, distorted the truth, or conveniently failed to remember significant events of his past. His insensitive and superior attitude was remembered so bitterly by some acquaintances that they refused to testify on his behalf, less out of fear of McCarthyism than out of dislike for Remington. The ambiguity of Remington's character creates a fascinating situation in which the victim is not a hero. May's meticulous research and lucid presentation set a formidable standard for future scholars aiming to uncover government secrets.